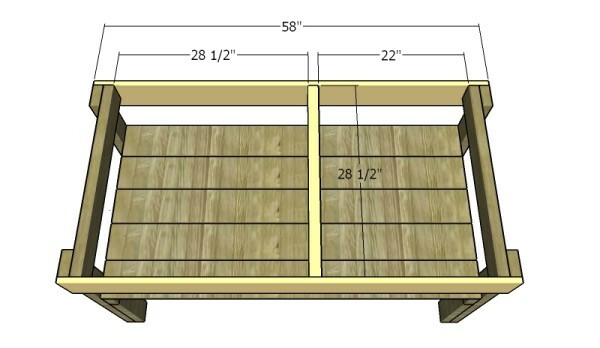 This step by step diy woodworking project is about XL big green egg table plans. 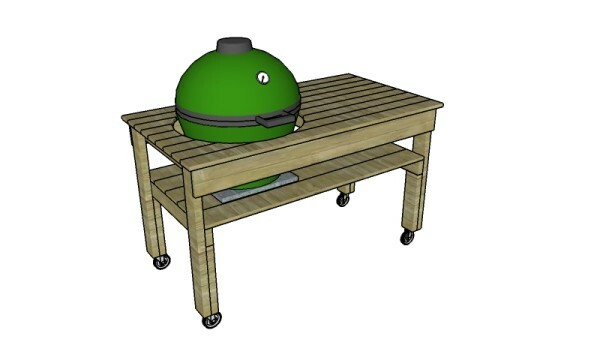 If you want to learn more about building a wooden table for your XL big green egg, we suggest you to pay attention to the instructions described in the article. You can build this table in just one weekend with common household tools and under 100 $ worth of raw materials. Make sure you take a look over the rest of plans to see alternatives and more projects for your garden. Work with attention and don’t forget that a good planning will save you from many issues and it will keep the costs withing the total budget. Invest in high quality materials, such as pine, redwood or cedar. Drill pocket holes before inserting the galvanized screws, to prevent the wood from splitting. Add waterproof glue to the joints, in order to enhance the rigidity of the structure. 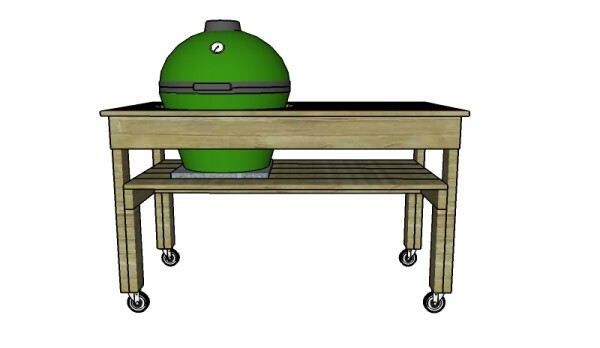 It’s that simple to build a big green egg table! The first step of the project is to build the sides for the big egg table. Cut the components from 2×4 lumber. Drill pilot holes through the horizontal braces and insert 2 1/2″ screws into the vertical legs. Align the edges with attention and make sure the corners are square. Next, you need to attach 2×4 supports to the base of the legs. Drill pilot holes and lock the components to the legs using 2 1/2″ screws. Add glue to enhance the bond of the components. 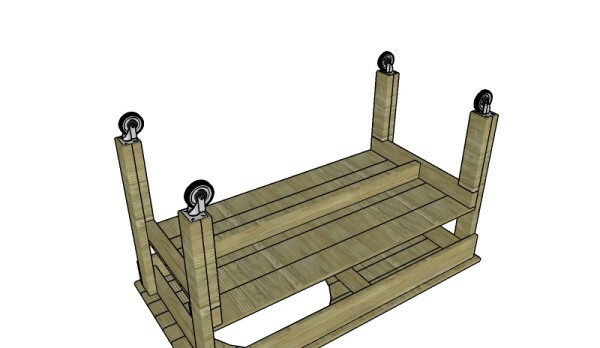 The supports will create a base for installing the caster wheels, so that you can move the table easily. 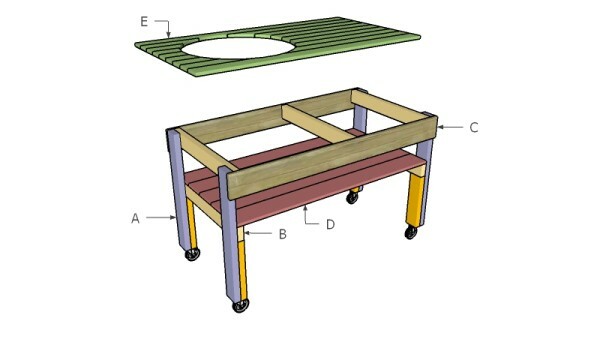 Fit the 2×4 stretcher to the base of the table, as shown in the diagram. Drill pilot holes through the bottom braces and insert 2 1/2″ screws into the stretcher. Center the stretcher to the braces. 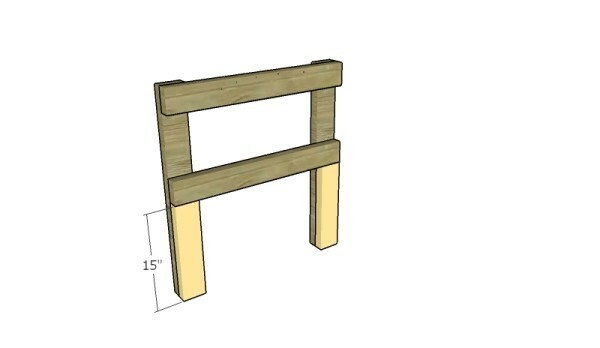 Attach 1×6 slats to the bottom braces to create the shelf. 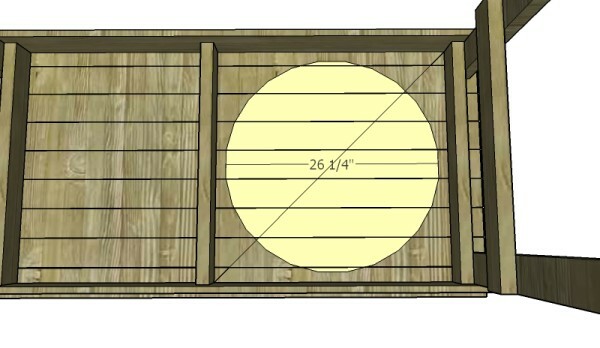 Place a piece of 1/4″ plywood between the slats, to create even gaps. Drill pilot holes through the slats and insert 1 5/8″ screws into the braces. 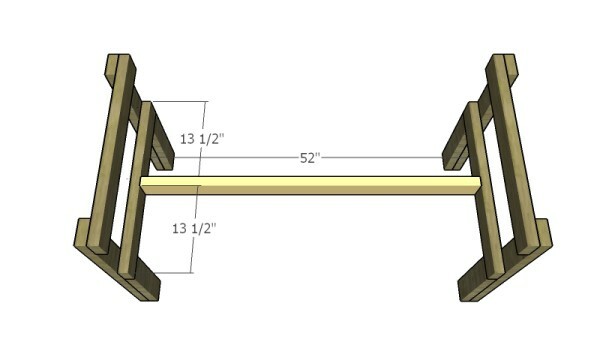 Attach 1×6 aprons to the top of the legs, as shown in the plans. Drill pilot holes and secure the aprons to the legs using 1 5/8″ screws. In addition, insert 2 1/2″ screws through the aprons into the top support. 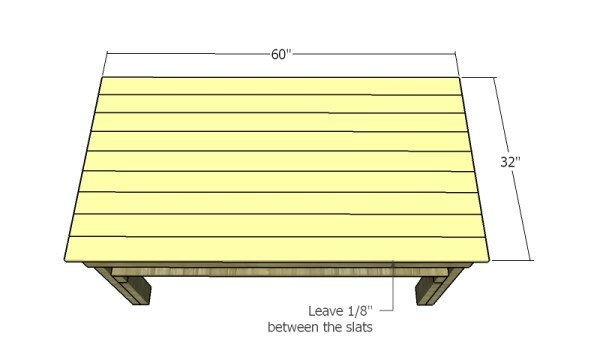 Attach 1×4 slats to the top of the big egg table. 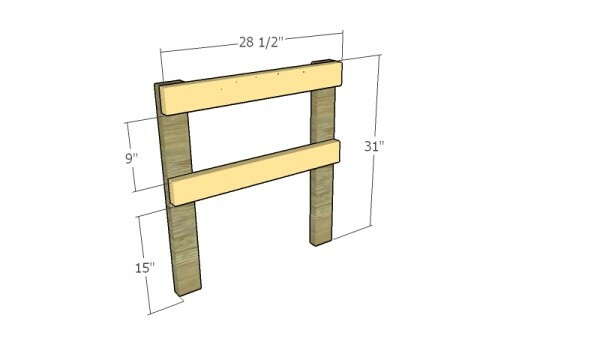 Leave about 1/8″ between the slats. Make sure the tabletop overhangs 1″ on all four sides of the frame. Drill pilot holes through the slats and secure them to the frame using 1 5/8″ screws. Next, you need to cut out the hole for the XL green egg. Mark the center of the square and mark the cut line. Use a jigsaw to cut out the hole. Smooth the cut edges with sandpaper and round the edges with a router, for a more finished look. Attach caster wheels to the bottom of the legs. Center the caster wheels to the base and lock them into place with 1 5/8″ screws. Fit a paver under the big egg. One of the last steps of the woodworking project is to take care of the finishing touches. Therefore, fill the pilot holes with wood putty and smooth the surface with 120-150 grit sandpaper. Top Tip: If you want to enhance the look of the woodworking project and to protect the table from decay, we recommend you to cover the components with paint or stain. 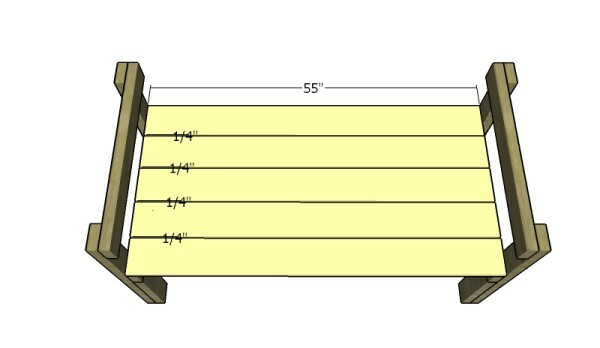 This woodworking project was about xl green egg table plans. If you want to see more outdoor plans, we recommend you to check out the rest of our step by step projects. LIKE us on Facebook and Google + to be the first that gets out latest projects.